Ruben is the former Head of Talent Development of the Academy at AFC Ajax Amsterdam and co-writer of the Plan Cruyff. As the son of a Spanish mother and a Dutch father, Ruben unites the best of both worlds with his passion and strong analytical skills. During his academic and professional career, where he specialised in organisational analysis, design and change, Ruben spent many weekly hours training as a triathlete, leading him to a career as a trainer/coach. In 2006, he decided to become a full time coach and said goodbye to his consultancy career. After a successful period in track & field and amateur football, he attained the position of individual trainer at the Ajax youth academy. Working together with Wim Jonk on various individual programs, he helped improve top talents such as Christian Eriksen, Toby Alderweireld and Daley Blind. In 2009, Ruben coached elite 800 metres athlete Bram Som back to world elite level. 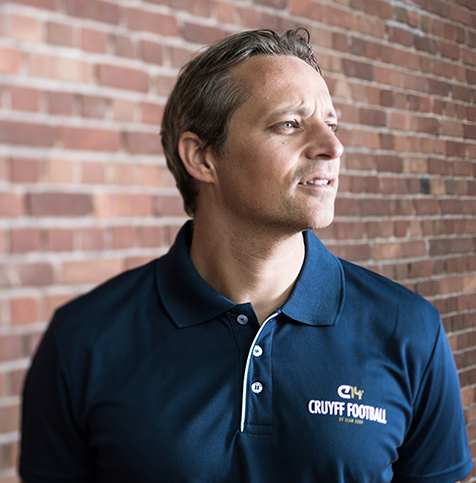 This process taught him so much about individual elite sports, that he decided to combine his knowledge on elite individual sports and organisational design and apply it to his work with Ajax’ top football talents. Consequently, he teamed up with Johan Cruyff and Wim Jonk in 2010 to write the Plan Cruyff. One of the main pillars of this visionary plan was the necessary upgrade and reform of the Ajax youth academy, based on an individual approach in talent development. After a period of great turbulence, often referred to as “the velvet revolution”, the club finally adopted the Plan Cruyff in 2011. Ruben was appointed Head of Talent Development and became responsible for the implementation of the plan in the academy. Between 2012 and December 2015, he implemented the Plan Cruyff and by doing so revolutionized the academy and the club as a whole. In collaboration with the Head of Academy, Wim Jonk, Ruben fundamentally reformed the Ajax academy structure as well as its culture, introducing a new philosophy that marked the players and their development as the indisputable focal point of the academy, in all aspects of its organisation and processes. Ruben holds a degree in Environmental Science from Wageningen University and a Master in Business Administration (MScBA) from Nijmegen Business School.